AAn action-packed Festival is being held in Houston that will bring a sense of togetherness, inclusion and much needed joy while residents begin to recover and rebuild. The Festival of Abilities on Saturday, October 28, 2017 from 3:00 – 7:00 pm, will benefit a landmark Playground for All Abilities at Oak Forest Park, which will be the first of its kind in Houston's central northwest communities. The park is located at 2100 Judiway, Houston 77018. The Master of Ceremonies will be Texas Radio Hall of Famer Scott Arthur. Abilities Expo Ambassador Michelle Colvard, a former Ms. 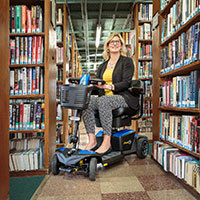 Wheelchair Texas and America, serves as the accessibility advisor to the Friends of Oak Forest Park. Without a wheelchair accessible playground currently in her community, Michelle is hopeful about being able to use the playground envisioned with her toddler daughter Anja. 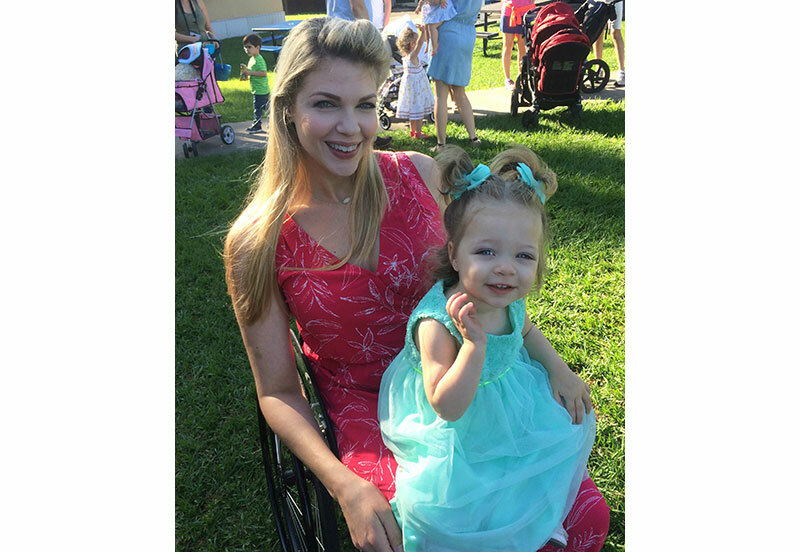 Michelle says, "I was born with Spina Bifida, and as a child, I often had to just sit in my wheelchair and watch the other kids playing on the playground. I'm now a mother of a little girl who is able to run around like most other kids. The Playground for All Abilities will be just minutes from my house and fulfills a childhood dream of mine: that kids of all abilities will be able to play together." Festival activities will include adaptive sports and an obstacle course hosted by Houston Parks & Recreation Department's Adaptive Sports & Recreation section, SIRE therapeutic horses, petting zoo, pick-your-own pumpkin patch, trick or treating, art tile painting fundraiser, tennis drills/sports demos, performances, costume contest with prizes, international food court, raffle and auction. The King's BierHaus Craft Biergarten will feature a Battle of the Texas Brews™ with a blind taste test winner to be featured on tap at the Heights location, 2044 E. TC Jester. Event wristbands (ages 2+) are a $10 donation in advance or $15 at the event. Festival packages will also be available for advance purchase and at the event. Cookie Joe's Dance Company will perform a special "She's Like the Wind" tribute to Patrick "Buddy" Swayze, a native of Oak Forest and Cookie Joe's longtime friend and dance classmate. The Houston Jazz Ballet Company, owned by his mother Patsy Swayze, was originally located at her dance school just steps from Oak Forest Park, now home to Apex Taekwondo. Cookie Joe's Dance Company is a continuation of the vision of Cookie's teacher and mentor Patsy Swayze. The school and performance company embrace the challenges and abilities of all of those who love dance. The acclaimed Fly Dance Company, known as the "gentlemen of hip-hop" will perform an interactive performance, with an opening act from The River Performance Troupe, a TUTS-based group of artists with disabilities. Master of Ceremonies is Kevin Quinn from 104.1 KRBE. Houston's Mayor Pro Tem Ellen Cohen, an advocate of the future playground as the District's Council Member, will make brief remarks at 5 pm. The honorary ambassador of the Oak Forest Park project is 11-year old Garrett Holcombe, who has spastic cerebral palsy, but has never let his disability stop him from participating in team sports and championing an Easter Seals Walk With Me team for the past three years. Garrett says, "It would be nice to have equipment for people with disabilities so they can play just like other kids their age. They deserve to laugh, scream, and play just like all kids." To find out more about the Festival of Abilities, contact Event Chair Elyssa Horvath at FriendsofOakForestPark@yahoo.com. You can follow Friend of Oak Forest Park for October advance wristband pick up locations and event updates. 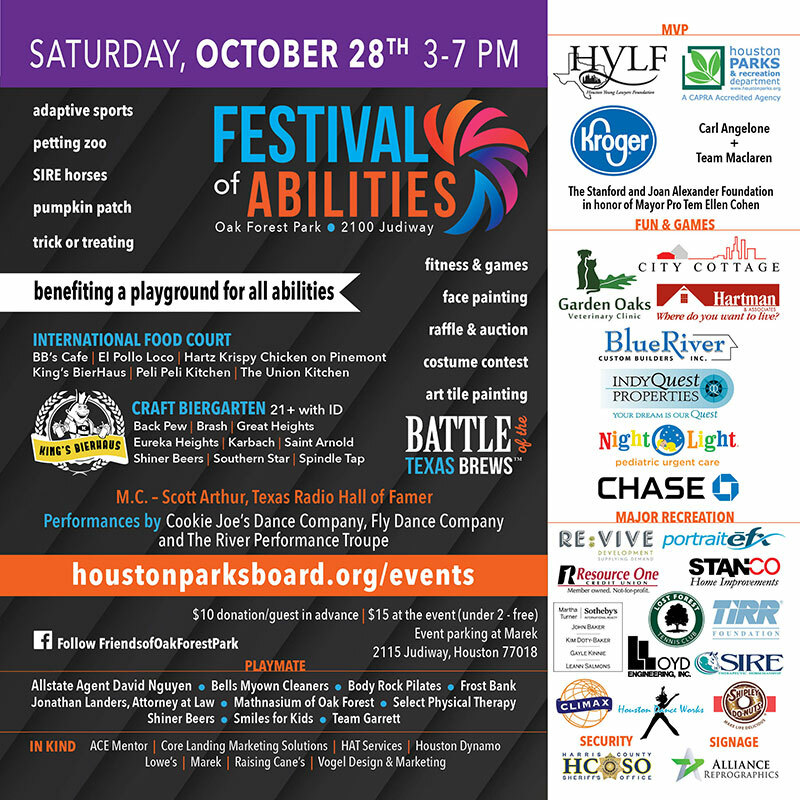 For more on sponsorship/donations and company booths, visit http://houstonparksboard.org/events/festival_of_abilities_2017.